River Basin “Dam Building” Negotiation game. Photo credit: Seth Cohen, IWR. On June 25-26, 2017 in Phuket, Thailand, ICIWaRM and the USACE’s Collaboration and Public Participation Center and Pacific Ocean Division convened a strategic collaboration and negotiation workshop with the Mekong River Commission’s (MRC) Joint Committee (JC) and Secretariat. The MRC Joint Committee comprises department heads (Director-General level) of National Mekong Committee Secretariats and oversee implementation of MRC work. The purpose of the workshop was to engage 18 members of the four riparian countries and senior MRC Secretariat staff in practical application of strategic collaboration, interest-based negotiation, and Shared Vision Planning for water resources challenges and collaborative basin development planning. Instructors, MRC JC members, and MRC Secretariat personnel. Photo credit: Seth Cohen, IWR. The retreat provided an opportunity for participants to reflect in an informal environment on the many complex issues with transboundary water resources development and management in the Mekong River basin. 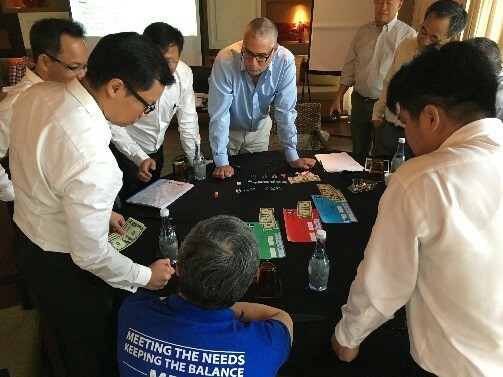 They participated in simulated negotiation on balancing national interests, transboundary trade-offs and the optimal and sustainable solutions for the Mekong basin as a whole. At the MRC’s request, a follow-on workshop is scheduled for November. The U.S. Department of State’s Lower Mekong Initiative provided partial funding for the event.